After programing the Arduino, I took out the ATMega168 and wried it into a breadboard along with a 16mhz crystal and 5 volt regulator. For the receiver I used the phototransistor wired into two logic gates of a inverting Hex Schmitt trigger. 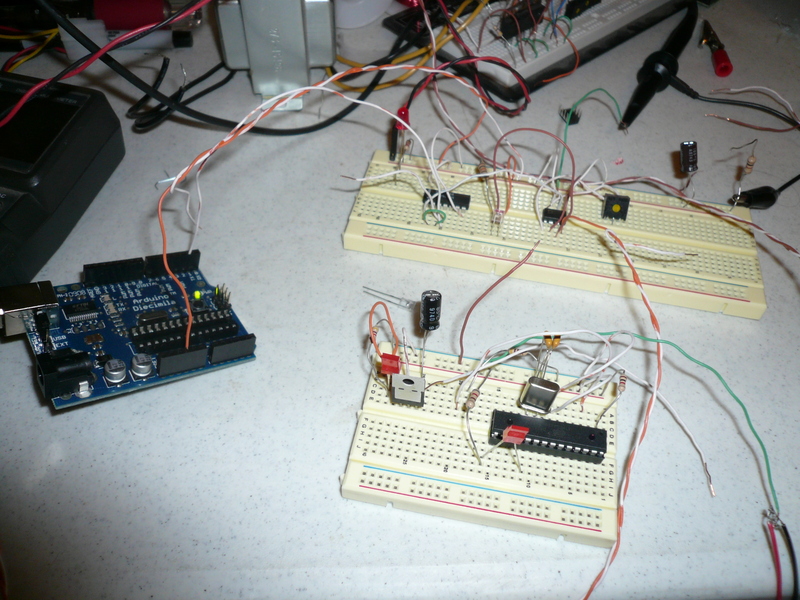 I used the Schmitt trigger to act as a buffer and ensure only proper logic level enter the USB to serial converter on the Diecimila board. While the first test was successful, I was was not able to place the led more than an inch away from the phototransistor. To allow for more range I used an AD620AN instrumentation amplifier IC. For control I wired the gain pins of the amplifier into a small 10k potentiometer. After adjusting the gain I was able to get about a foot of range with reliable data transfer. Any further and there was too much noise in the signal. At this moment I wondered if I could use a laser to extend my range. I happened to have a small laser that I pulled from a cheap laser level. I pulled out the laser and wired it where the IR led was minus the resistor. I then pointed the laser at the phototransistor and noticed it instantly reacted. In fact I had to turn the gain on the amplifier way down to use the signal. To test my range I wired my ATMega168 to a 9v battery and mounted the laster in a small vise a few feet away. After adjusting the gain I was able to transmit data easily. 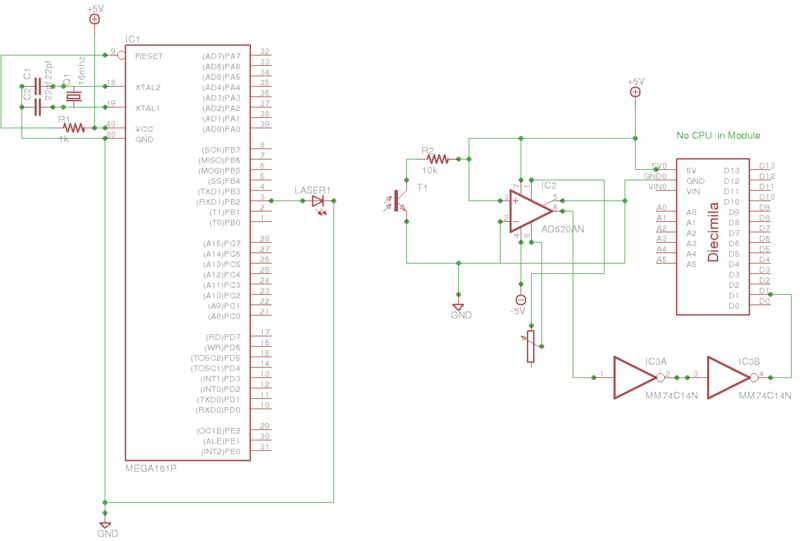 Attached is a video along with the final schematic I used.